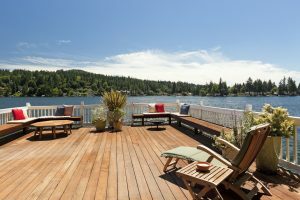 Looking to revamp your old deck but don’t have the money or time to replace it? Staining is a great way to brighten up your outside area and make that old wood look a few years younger. The best way to choose a stain is to treat it like picking out paint for a room — consider what aesthetic you want, what will match the surrounding area or furniture and if you are trying to cover any damages or stains. Break away from traditional dark or light wood stains and instead, opt for something with a pop of color. Red: This strong color will easily cover any old markings and stains and will surely make the area stand out. But this much color may be best used on small areas, as to not overpower the entire backyard. Blue: Transform your backyard into a relaxing oasis with hues of light blue. Green: Embrace your backyard’s natural foliage with a light green patio or deck. For homes surrounded by trees and greenery, we recommend choosing a green with grey in it. Clear: A clear stain is just that, clear — so this stain is best used for newer or expensive wood you want to protect, rather than cover. Tinted: Looking for some color but not ready to really take the plunge? Tinted stains contain just a bit of color, great for creating a new clean look without completely changing the look of your deck. Semitransparent: With a deeper pigmentation, this stain will show some of the wood’s grain pattern, but cover most small imperfections. Solid: If you’ve replaced parts of the deck or have deep stains in the wood, this is an ideal choice as it will cover wood completely in a thick reddish hue. Staining your deck not only improves it’s look, but also protects it from scratching and UV rays. For more information about wood preservation, give the experts at North East Home Improvement a call today! (203) 321-6695. My husband and I were talking the other day, and we were saying that it would be so fun to install a deck on our house. We love to socialize with our family, but it seems that when we are inside and the television or something gets playing it is really hard to connect with them. We think having a deck would give us a great space to talk with them. I like the idea you give of using a semitransparent stain that shows some of the wood’s grain pattern, but also covers most small imperfections. We’ll have to make sure we find a reputable installation company that can provide all of this at a reasonable price.